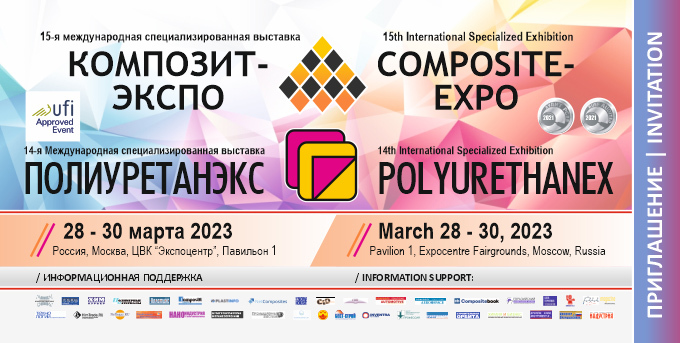 This exhibitor took part at Composite-Expo 2009 on February 25 - 27 in Moscow, Russia. Sale of materials assigned for fibre-glass reinforced plastics and artificial stone manufacturing: polyester resins, gel coats, adhesive bonding pastes, pigmental color pastes, groundings primer and fillings of Cray Valley; reinforcing materials of Owens Corning, LANTOR, SAERTEX and Colbond; resources for mould treatment mold releases: wax and system of dividing agents of AXEL, polishing pastes; assembly adhesives from Plexus; fillers from R.J. Marshall for artificial stone manufacturing; honeycombs materials based on polypropylene from Nidaplast Honeycombs for sandwich panels production. Sale of alkali resistant glass fibre Cem-Fil: Cem-Fil Anti-Crak – alkali resistant chopped fibres created for concrete reinforcement (glass-fibre concrete), fillings and water-soluble dry mix: Cem-Fil 53/76 – roving made of alkali resistant fibre glass, used for the production of glass reinforced concrete by spray method; glass-fibre mat Cem-MAT for finishing buckle – specially developed alkali resistant system, created for using in very thin layers. Sale of materials for roofing manufacturing. Sale of base glass.